Turkey . attractions . places to visit . Istanbul . Alacati . Turkey is incredibly rich in culture, history and nature. Depending on your interests and vacation style, there is definitely no shortage of places to visit in Turkey. The country has a long history of varied religious traditions and diversity in architecture, which has significantly enriched what it has to offer to its visitors. This includes historic sites from Roman ruins to ancient Christian churches and magnificent mosques. It also means a varied cuisine and cultural heritage. Plus, Turkey boasts beautiful natural phenomena as well, from beaches to hiking. With so many things to do in Turkey, how do you choose? Here is a solid plan for first-time visitors to Turkey. Almost inevitably, you will start your journey in Istanbul – the country’s biggest city and economic capital. While many people only spend a couple of days in Istanbul on their way to other destinations, the city can definitely offers weeks of entertainment. There is no shortage of places to visit in Istanbul, so if you have some extra time, it’s a great idea to spend at least a week here. You can start with the basics, like visiting the Hagia Sophia, the Blue Mosque, the Suleymaniye Mosque, and the Basilica Cistern. 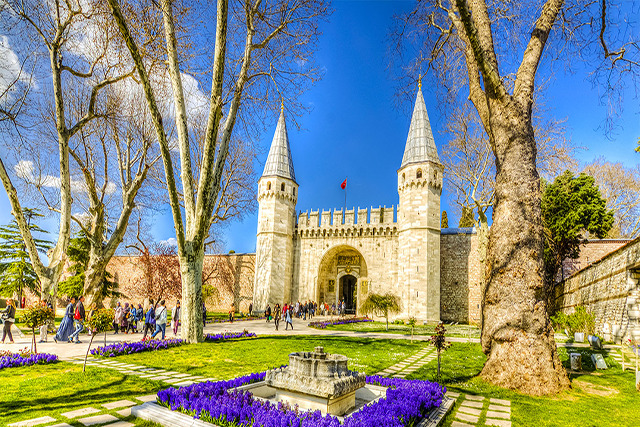 Then, head to the Topkapi Palace or the Dolmabahce Palace. Also, don’t miss a cruise on the Bosporus, which connects the city’s European and Asian sides. For those looking to learn more about the history of the city, the Archaeological Museum and the Museum of Islamic Art make for a great visit. If you are in Istanbul a little longer, then take a ferry to the Asian side and explore its vibrant neighborhoods. Discover the colorful Balat, enjoy breakfast near the Rumeli Hisari fortress, or check out the calligraphy collection at the Sakip Sabanci Museum. From Istanbul, it’s a good idea to head to the beach. One great place that’s not too far is Alacati, however there are many more options on the Marmara and Aegean coast. If you do choose Alacati as your destination, then you can fly to Izmir from Istanbul or take a bus. To be fair, the cost will be almost the same, but the bus is much less comfortable. Izmir, while often overlooked, offers lovely walks along the seaside and absolutely delicious food. From here, head down to Cesme, the quaint and pretty town on the Alacati coast. It feels more like a greek village and is a very romantic place to stay. There are a few beaches to choose from in the area. Some offer great windsurfing, while others are calmer and more family friendly. If you are looking for warmer waters, don’t miss Ilica, where the sea water mixes with hot springs! 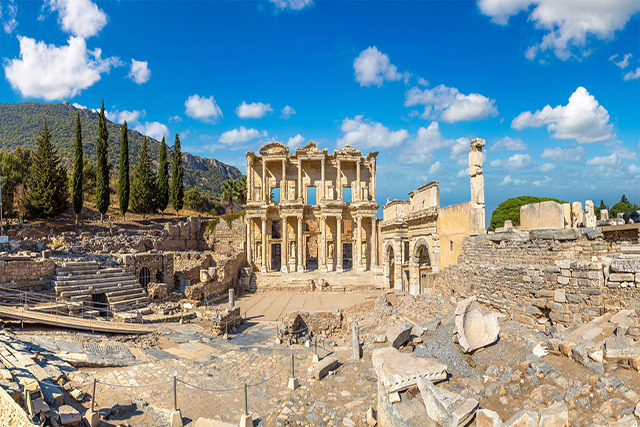 One of the most popular destinations in this part of Turkey is Selcuk, or rather, the Ephesus ruins located in Selcuk. 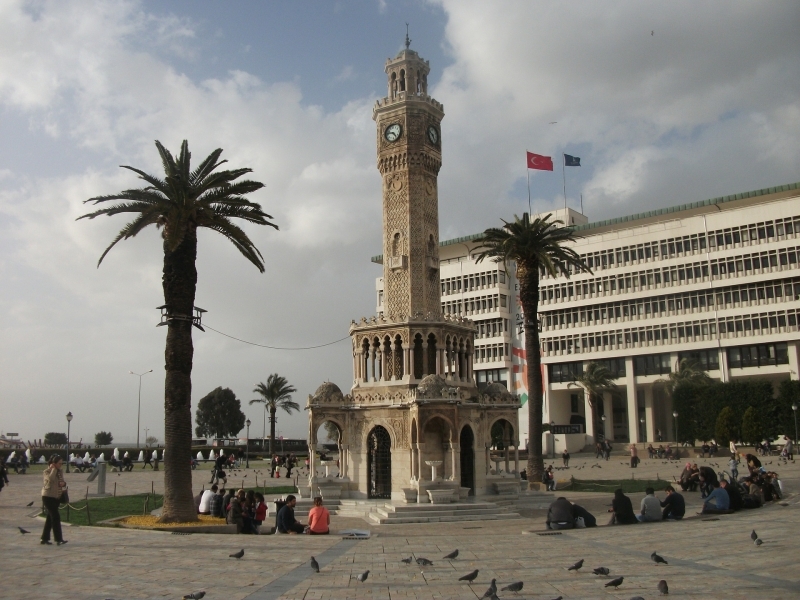 This can be done as a day trip from the nearby destinations, including Izmir. However, you can also stay in Selcuk overnight – it’s a pretty place and can be a relaxing getaway. The Ephesus ruins are impressive and deserve a few hours of exploration. The most iconic here is the Library of Celsus and the Ancient Terrace Houses. For real history buffs, you can visit the remains of the Temple of Artemis, one of the ancient wonders of the world. However, note that only a single column is left of it. If you fancy a delicious lunch with stunning views, then don’t miss the nearby Sirince village. You can also stock up on delicious souvenirs here! Pamukkale, while not listed as a world wonder, it definitely is impressive. You can get here either driving or taking the train from Selcuk or Izmir to Denizli and then a bus to the town of Pamukkale. The site is a mountain of glistening white travertine – naturally formed calcium pools, filled with mineral water. It’s absolutely stunning. The area was a Roman settlement, with a stunning amphitheater, some impressive ruins and a place where you can let your imagination run wild on the indulgent lifestyle of ancient ruins. In fact, you can still swim in some of the pools today, which is a real treat. 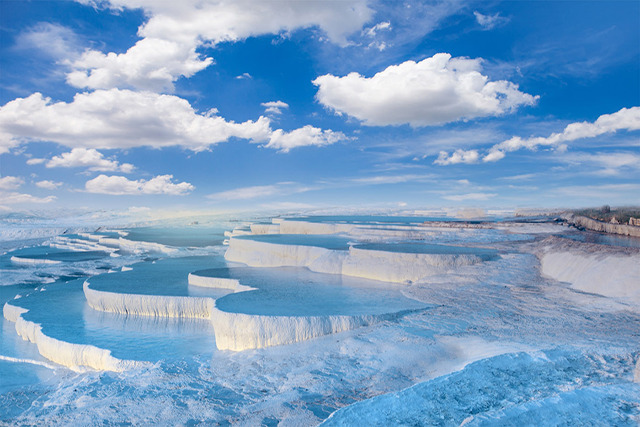 Once, Pamukkale was probably the most famous destination in Turkey. However, the poorly controlled mass tourism has caused a lot of damage to the natural site. Since then, UNESCO and the Turkish government have actively been working to bring Pamukkale back to its natural beauty, but it will take years to completely restore it. So please consider this when visiting and follow the rules indicated by the current site management. Even if you do nothing else on this list of places to visit in Turkey, Cappadocia is not to be missed. It’s an absolutely unique and stunning area of the country. It offers history, nature, culture and adventure all in one package. Smack in the middle of the country, the easiest way to get here is by bus or car from Denizli or a flight from Istanbul. While some people stay for only a day or two, four days will give you a better overview of the area, although you can even spend more time here. 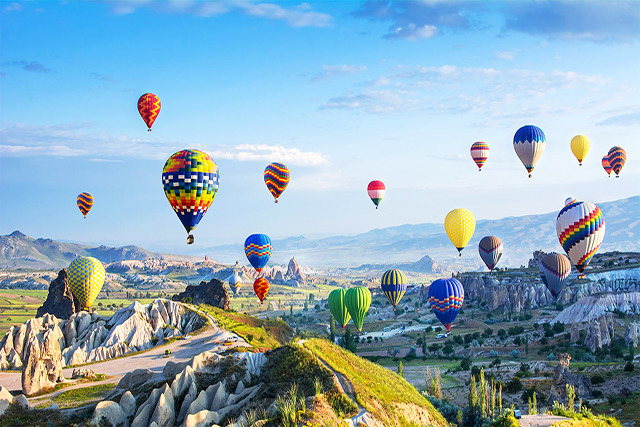 Most visitors stay in Goreme, the town famous for its cave hotels and the stunning hot air balloon flights. This is an activity not to be missed, since you get the chance to fly over the beautiful Cappadocia landscapes. On the other hand, you can visit the ancient Christian churches and settlements carved into the local caves, including the Goreme Open Air Museum. There are also some interesting completely underground, such as the Dirinkuyu and Kaymkli. Another unmissable place to visit is Uchisar, a carved castle overlooking the surrounding landscapes. This makes up the standard itinerary in Cappadocia. What many tourists miss, however, is the amazing opportunity to hike through the surrounding valleys. The hikes are pretty easy, but absolutely stunning. When here, check out Love Valley, Red and Rose Valleys, White Valley, among others. Turkey is incredibly rich in culture, history and nature. Depending on your interests and vacation style, there is definitely no shortage of places to visit through Turkey Travel Packages!